An exciting new Mediumship Development Class that finally bridges the gap between Science and Spirtuality! either in person - or - via Go To Meeting! or in the comfort of your home - via GoToMeeting! All workshops are taught using PowerPoint Presentations. to request an appointment for a workshop. a couple of openings to choose from! Whether you're a novice... or you have some limited abilities, you’re in the right place! My workshops are for everyone, so the only thing you need to have is a desire to learn - and be willing to practice! Basic descriptions of each workshop are listed below... and once I receive your request, I will send you a couple of openings to choose from. And if you're not local, we can schedule workshop sessions via GoToMeeting. Meanwhile, I hope that you will join me for an 'Afternoon of Enlightenment'! since I do have two CATS. as dust-free and dander-free as possible, before your arrival. Everyone has natural intuitive abilities... But intuition is just like anything else; the more you use it, the sharper it will get. The only difference between someone who is ‘intuitive’ – and someone who is considered to be ‘psychic’, mostly depends upon how much effort they put into honing the skill. Think about how your muscles work... say for instance, if you were training at the gym to build up strength and stamina. Well, developing your psychic ability isn’t really much different... except that you would be building up ‘mentally and spiritually’ – instead of physically. And as any good trainer will tell you, the key to success is practice, practice, practice! First, I will share my personal philosophy with you as I provide you with clarity about the many different aspects of psychic ability and mediumship, or the nuances of Tarot or Astrology, depending on which workshop you select... so that you understand what each component is and how it works. Secondly, I will provide you with a grounded foundation which will allow you to exceed any limitations that you may have experienced in the past. This will include learning a few simple techniques, practices and exercises that will assist you in developing your skills to the level you would like to achieve. those who think they can... and those who think they can’t. If you’re one of those people who thinks you can, then register for a workshop below... and let me show you how to take your skills to the next level! Therefore, no guarantees can be made regarding your abilities. These workshops are not geared toward advanced students. and they are not intended for students seeking Mastery. During each session of this two-part interactive workshop, I will show you how to open your awareness to a higher vibrational dimension, as we keep the main focus on those in the afterlife and communication through mediumship. You'll learn about the relationship between physics and metaphysics... as well as the importance of understanding symbolism, achieving a good meditation practice and how to establish a telepathic link with 'The Other Side'. I will also provide you with some basic distinctions in terminology, as we discuss the many tools and methods used to detect spirit communication and the 'triggers' you can use to stimulate your perceptive centers. As we bridge the gap between science and spirituality, you will come to understand mediumship from a very different perspective! much more clearly and effectively! which will include critique and feedback. 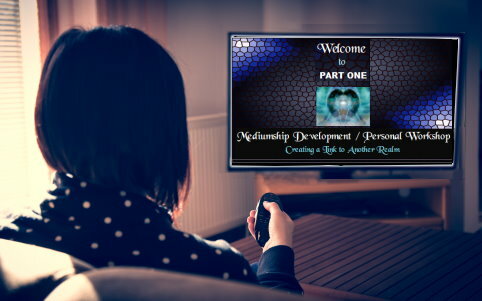 In Part One: We'll cover the many tools and methods to detect spirit communication... How to understand and interpret symbolism, using two exercises... We'll delve into significant books and authors in the world of metaphysics... And what is behind mediumship science, through testing, studies and certification. In Part Two: We'll look at several types of mediums and how their abilities differ. I'll also teach you how to handle difficult scenarios and difficult people and the best way to convey information from spirit... I'll share the 'target questions' to ask yourself in order to increase your information flow... And I'll share the 'key' to interpretation and delivery', enabling you to refine your skills in a professional way. After taking you through a five minute guided meditation to connect with spirit, I'll ask you to do a 3 to 5 minute mediumship reading, followed by feedback and critique. NOTE: If you are traveling from a distance to do this workshop in person, I could arrange to do this in one longer session - but it would probably take about 3.5 to 4 hours. all the basics of how to do a Tarot reading! The meanings of the positions in the spread. The significance of card numbers. The significance of the suits. I will also cover the reversed meanings of cards... as well as different types of card spreads. We will also explore an array of different decks so that you can familiarize yourself with the esoteric imagery of Tarot. This is a fun workshop! And using a special five-page key that I've prepared for you, you'll be able to try your hand at doing a three card spread during the last hour. And the key is yours to take home and practice with! Please bring your own deck with you. If you don't currently have a deck [or if you're in the market for a new one], you can view a fine selection of decks with every theme imaginable at the following web site: http://www.aeclectic.net/tarot/index.html - They do not process orders, but if you find a deck that you like, just plug the name of it into Google to see where you can purchase it. For those attending in person: I'll also have about 15 different decks on display for your review. In One Session: We will cover all of the above, including a practice session using your own deck! I'll provide you with book recommendations and will also guide you through an effective meditation technique as well as having you participate in several different exercises that are simple and fun... so that you can personally experience clairvoyance and psychic awareness for yourself. I will explain the distinctions regarding different states of consciousness... and will show you all the tools used (and there are quite a few!) for different methods of divination. Q&A based on your personal experiences is an integral part of this workshop where you'll learn to open your 'psychic sensory pathways'... So let's take your intuitive abilities to the next level of development! In One Session: We will cover all of the above, including several exercises to promote psychic development. Unlock the secrets of your own birth chart! Your natal chart is a precise snapshot of all the planetary bodies in the sky at the moment you took your first breath on Earth! Once you learn to read the language of astrology, you can see your strengths, your weaknesses, your tendencies... and much more - just by understanding how to read the glyphs in a chart. The Signs of the Zodiac -. The Twelve Houses - . The Cardinal Points - . Without that information, your natal chart will not be accurate! Note: If you don't know the exact time of your birth (and if it's not on any documents you currently have), contact Vital Statistics in the city you were born, and request a LONG FORM BIRTH CERTIFICATE. And if all else fails, talk to parents and other family members to come as close as you can to the time of your birth, preferably, within a one to two hour window. Astrology is much more than just reading Sun sign horoscopes in the local newspaper! So I hope you'll join me for a dynamic look at how to read your natal chart and how it reflects what makes you so unique! In One Session: We will cover all of the above, including some analysis of your natal chart, as time allows. Each personal workshop session is scheduled during afternoon hours [Eastern Time]. They can occasionally run a few minutes longer or a few minutes shorter than the specified time. All workshops are taught using a PowerPoint presentation. If you're not local to me in New Jersey, all you need is a computer (and a headset or phone)... and I can teach you the workshop via GoToMeeting.com. Personal workshops will be held at my home/office on 18th Street in Union City, New Jersey, right off Kennedy Blvd... I'm located about two miles from the Lincoln Tunnel. The location details will be sent to all registrants by email. Union City is located in Hudson County, NJ... right across the Hudson River from midtown Manhattan. If you will be traveling here from a distance, there are some useful things to know. When making your flight arrangements, the closest airport to me is Newark International Airport [EWR] which is about a 15 to 20 minute drive away. You could also fly into LaGuardia or Kennedy Airports in New York, but the drive from there to New Jersey will take about 40 minutes to one hour, depending on NYC traffic [and you'll need to allow about 90 minutes or longer, if you'll be travelling during rush hour]. The closest hotel to me is a Day's Inn in North Bergen, NJ; it's less than a mile away. However, if you'd like to check out some other hotels (for availability and rates), there are quite a few of them in the next town over in Secaucus, NJ; hotels in Secaucus are only about a 5 to 7 minute drive from me - and UBER service is readily available in this area. Note: It's only a five minute drive from my location to midtown Manhattan... unless it's rush hour - which turns a five minute drive into a one hour drive. Some people have requested a personal reading on the same day that they take my workshop, however I'm not available to do private readings on the same day as a workshop. If you are local - or traveling here and plan to spend a few days in this area, I can try to schedule you for a private session on the days before or after a workshop. Otherwise, I will be happy to check my availability at the end of the class to schedule a private appointment for you at a later time, either in person or by phone. Credit Card charges on your statement will reflect billing from: Doreen Molloy, LLC. via email when your credit card is processed. Which I reveal in great detail, since each one is of special interest to me! are unlike anything that you've ever seen before! In fact, some of the images might really shock you. However, all of the information that I've discovered is well sourced. Join me for an enlightening afternoon! 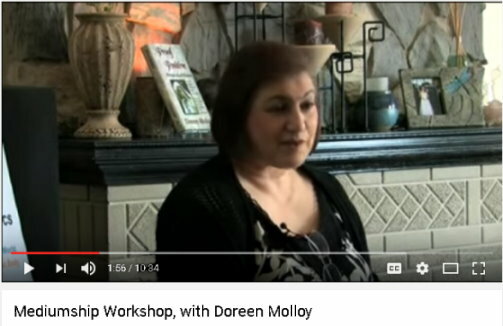 "I recently had the great pleasure to sit in on one of Doreen Molloy's Mediumship Development workshops... I was blown away! Not only does she teach this subject with a practical, hands-on approach but as an observer, I witnessed true magic happen. With gentle guidance, she took each student and one by one, 'pulled the medium out of them'. If psychic or mediumistic abilities are gifts you would like to cultivate, Doreen Molloy is without a doubt, the best teacher out there!" First off, I want to thank you for holding this class. I was a student in your Psychic Development Class and enjoyed that learning experience... But the Mediumship class just blew me away! Your guidance and knowledge was an inspiration to us all. But most of all, it's your gentle way in helping us to understand that draws us near. I have told you before and I will tell you again, you are an inspiration and mentor to me... for which I will be eternally grateful. I enjoyed your Mediumship class -- and would love a more advanced workshop when you can offer it. I would love to learn more, especially involving delivery and interpretation... I know that most of that comes with time, practice, and experiences... And I loved watching the experiences others had when reading "the other side". All were very different and it fascinated me. Jessica's strong and raw clairsentience abilities reminded me of some of my own experiences years ago -- and they still occur occasionally with stronger spirits. Kelly's experience was very insightful and I'm glad that came up in class... Mary Ann was great and her accuracy was amazing. Thank you so much for the experience and for your insight! I really enjoyed the Mediumship class... and I wanted to have more feedback on the reading I gave (that's all I kept saying after the class). Well, I got my feedback a day later -- in a dream! I asked for more proof and feedback, so I guess I got it... I'm very much looking forward to the next workshop. Oh, and what a beautiful voice... thanks for sharing; it was a wonderful way to end an amazing class! Remember, always follow your passion! The Mediumship class exceeded my expectations in every way. I am truly a novice at this and have never performed an official reading or been a part of one, but you provided the comfortable, supportive, informative environment to allow all of us to have amazing readings. I honestly had no idea that I could actually perform a reading and get so much information on my first try! I learned so much about Mediumship, myself, and others' experiences. I would definitely recommend this class to anyone who may have an interest in Mediumship, or to those who may want to test out their skills. I wanted to thank you for a fantastic workshop today. I have always been fascinated about psychic abilities and thought that I would attend this workshop to educate myself and observe everyone - and all that they had to share. I truly never thought (but secretly hoped!) that I would show any potential for having something to develop myself. I don't know if it was just luck or good guesses... but those minor successes that I had during the exercises today really reminded me to trust in my instincts. It was such a boost to my confidence and I am so excited to explore more of all of the things that you taught us about today. Thank you for making it such an interesting program and for being so encouraging to all of us. I jotted down all of the books that you mentioned today... but if you have a few that you would suggest for the beginner, I would love some suggestions! I just had to write to tell you how much I enjoyed the mediumship workshop yesterday! It was such a wonderful experience... and all the ladies I traveled with agreed that it was quite a well spent afternoon. I felt that the way you presented the material was very comprehensive and done in a sequential manner that made so much sense. When we were finally ready to do the guided medtiation, I was able to relax and really felt like I was 'connecting with spirit'... and the experience of communicating with spirit just felt so natural. I think that was the piece I have been missing all along... And while I expected to 'feel somethng mystical', it was more like speaking my thoughts. Thank you so much for the clarity you gave me... and to us all! And thank you for sharing your gift with us! Simply fill out the Registration Form below (or send me an email at doreen@doreenmolloy.com). Once you select an appointment date, a confirmation email will be sent to you. Note: It's a good idea to schedule Part Two of the mediumship workshop within a month after taking Part One, so that the material is still fresh in your mind. PLEASE NOTE: Without an email address, I'm not able to respond to you! You can add another phone number under 'Comments'. Mediumship workshops are scheduled in two separate sessions. Comments: Is there anything else you would like to ask or tell me? to the terms stated at the bottom of this page. Your registration will be processed and you will be contacted by email. And I look forward to assisting you on your metaphysical journey! The level of achievement after taking any of the workshops offered is unique to each individual and is fully each person's responsibility... Therefore, no guarantees can be made regarding your abilities. These workshops are not geared toward advanced students. If you are already proficient and working as a professional psychic, medium, tarot reader or astrologer, kindly note that the workshops offered here will provide you with basic information only and are not intended for students seeking Mastery. Payment is expected on the day of a workshop (unless you prefer to prepay by credit card or money order). Workshop fees are non-refundable. The information contained in this web site is designed to provide you with entertainment and metaphysical insight into several areas of parapsychology. All types of workshops, lectures or consultations offered are only available to adults 18 years old or older; exceptions can be made for parents and/or guardians that request services for someone under the age of 18 providing they give written permission for such. Any information provided by Doreen Molloy is not intended to replace any type of psychological advice, therapy, counseling, diagnosis, treatment or cure for anything that you may be seeking a remedy for. Nor are workshops, lectures or consultations designed to replace medical, legal or any other professional services or advice. All services are designed to provide you with various types of insight, ideas and/or suggestions that you may find useful when making personal decisions or or to assist you in moving forward. Doreen Molloy is licensed through the Grief Recovery Institute® of CA as a Certified Grief Recovery Specialist®; any insight provided that relates to grief, is based on The Grief Recovery Method®, a re-education program that enables one to participate in their own healing process. However no guarantees can be made with regard to the speed or depth of ones healing and recovery from grief, since each individual is different. All and any insight shared during a workshop, lecture or consultation is intended to help you make the best possible choices for yourself so that you may live your best life and achieve wellbeing in body/mind/spirit. Many areas of the psychic and spiritual realms are still experimental, so nothing can be guaranteed. Clients are provided with insight only and are always encouraged to make their own choices when it comes to personal life matters; refunds are not issued if there is a difference of opinion. All workshops, lectures, consultations and services provided by Doreen Molloy are billed at the rates listed and are non-refundable. The fees for workshops lectures and consultations are based on the length of the event and/or for the amount of time spent with you, not for the insight provided and/or any general discussion during sessions or events. Any advice, conversation or information that you receive from Doreen Molloy [or from this web site] is strictly open to your own personal interpretation, which some may disagree with. Therefore, Doreen Molloy shall not be held liable for any assessments or decisions made by those who seek out her services. By submitting your request to Doreen Molloy, you are agreeing that you fully understand the above statement.